WASHINGTON (AP) - Economic growth is gaining momentum, with factories busy and service firms expanding, but one critical area still lags: job creation. The harsh winter weather, however, is a wild card and may temper January's employment gains. Heavy snows caused some companies, particularly those in construction but also in manufacturing, to suspend work. That likely resulted in temporary layoffs. Even broad economic growth may not mean a sharp increase in new jobs anytime soon. Dutta, for example, points out that companies are spending much more on new computers, machines and other equipment than on hiring. That trend is likely to continue this year, he said, making it harder to bring down the jobless rate. It takes about 125,000 new jobs a month just to keep up with population growth. The economy needs to add more than double that amount to make a significant dent in the unemployment rate. In the past three months, job gains have averaged only 128,000. Rapid hiring that makes a large dent in unemployment "still remains elusive," Dutta said. He expects the unemployment rate will still be above 9 percent by the end of this year. Still, Thursday's data suggest the economy is gaining momentum. "Firms are beginning to say, 'wait a minute we're beginning to see enough increases in sales ... and we've exhausted our productivity gains,'" Federal Reserve Chairman Ben Bernanke said Thursday, while addressing reporters at the National Press Club. The latest evidence came Thursday when the Institute for Supply Management said that its service sector index rose to 59.4 in January. That's the highest since August 2005 and marked the 14th straight month of growth. Any reading above 50 indicates expansion. Earlier this week, the trade group said factory activity in January expanded at the fastest pace in nearly seven years. Both the ISM's factory and services reports showed that order backlogs are growing. That gives companies more certainty that sales will keep rising. "It's that backlog of orders that gives businesses the confidence to go out and hire more workers," said Mark Vitner, an economist at Wells Fargo Securities. Another positive sign for hiring is fewer people applied for unemployment benefits last week, reversing a spike from the previous week largely caused by harsh winter weather. 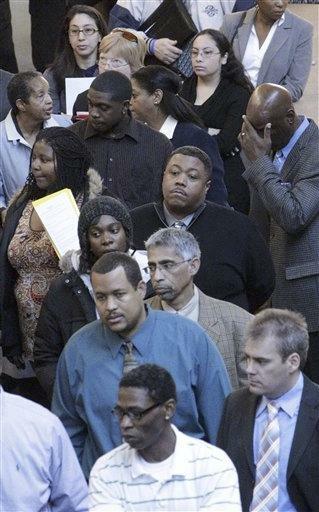 Applications fell to 415,000, the Labor Department said. That resumes a downward trend that took shape late last year and gave rise to hopes that employers would step up hiring. Applications are well below their peak of 651,000, reached in March 2009, when the economy was deep in recession. Fewer than 425,000 people applying for benefits is consistent with modest job growth. But applications would need to fall consistently below 375,000 to signal a likely decline in the unemployment rate.